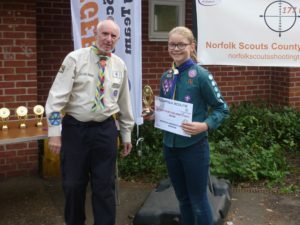 Following the District Shooting Competition in April, Northern Norwich District entered two teams in the County Scout Shooting Competition at the 1st Taverham Scout HQ on the 24th September 2016. Team Two – Cole Knights and Anastasia Killow (16th Norwich), William Purdy (3rd & 4th Norwich) and Cameron Husband (1st Taverham). The participants competed in four disciplines – rifle standing, rifle kneeling, rifle prone and pistols. The competition was keenly fought and the results were very close. Our first team finished 1st with an impressive score of 1835 points, which was 65 points ahead of the second placed team. Our second team finished 4th. 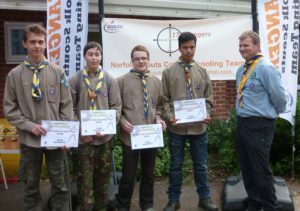 This was the fourth consecutive year that the District had won the County Competition which is a fantastic achievement made possible by the dedication of the scouts and the support of their Scout leaders who have helped their scouts to improve their shooting skills. HAndS Explorers entered a team in the County Explorer Competition on Sunday 25th September and finished a creditable second. There were some terrific performances by the team members – Alex Bretton, Alex Slaughter, James Dearden and Jared Stanton. In the individual competition Alex Bretton finished with an equal highest score of 486. The winner was decided by a count-back on third targets shot resulting in Alex being given the second place. He also finished as the highest scorer in the “Rifle Standing” and second in the “Pistol” competition, while Alex Slaughter finished equal 3rd in the “Rifle Prone”. The Explorer Scouts have all previously been part of the Scout competition team and we are delighted that having moved to Explorers they have maintained their interest in this activity and have continue to improve their skills.